Break a Leg – Just Don’t Break a Tooth! As the opening performance of Tarzan the Musical approaches, we are pleased to announce that we are AmityBill Advertising Partners for this exciting show! We are one of only a few dental offices making such a significant financial commitment to this production. 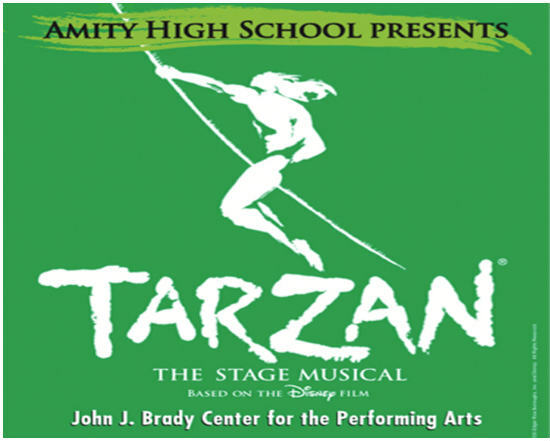 Tarzan is scheduled to kick off on Friday March 20, 2015, at Amity High School in Woodbridge. Many of our patients make up the Cast, Crew, and Orchestra! In addition to being Advertising Partners for the show, we have another connection. Several of our dental patients are involved with Tarzan as either Cast or Crew members or playing in the Orchestra. As a result, our entire office has a special connection with this Amity High Production. In addition, Ryan Rappaport, son of our Office Assistant Cathy Rappaport, has a major role in the show. This past week, he has been rehearsing from 5:30 to 10 PM. Go Ryan! We’d like to wish all of our dental patients – either audience members or those involved with the show – the very best. And remember – break a leg – just not a tooth!